The gigantic neon sign hits you like a ton of bricks as you drive down 21st Street in Astoria, a Queens neighborhood that was solidly Greek two decades ago: “PUNJAB AUTO SHOP.” This is America, but the owner didn’t try to be accommodating by calling his garage American Auto Shop or even A-1 Auto Shop. Look at that bold, proud sign and you immediately think of swaying wheat fields, sarso da saag and makai di roti! Yes, Punjab is in the blood of the Punjabis – no matter which side of the border they come from. The owner of Punjab Auto Shop is Abdul Hamid, a Pakistani American who hails from Gujjranwala in Punjab, Pakistan. 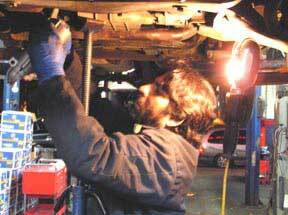 The head mechanic, who oversees a team of 35 mechanics, is Param Pal, an Indian American from Jullundar in Punjab, India. Together the two collaborate on making things right in the auto world: checking the heartbeats of ailing engines, listening to the cough of exhaust pipes and giving thousands of taxis their health inspections. If you’re an automobile and under the weather, this is the place to be. It’s open 24 hours a day, 7 days a week. Obviously Hamid did something right, for today he owns the prime property the huge garage stands on, and four more garages, including three on the same street! He and his wife Naseem now live in upscale Whitestone, and his three children, Umar, Waqas and Sara, are all attending college. The American Dream in motion, one yellow taxi at a time! In the meantime Astoria itself has changed. It has attracted a large South Asian population and the street is packed with halal stores and desi restaurants. Indeed, the garage is at a prime location – between the city and the airport – and taxi drivers drop in all the time. Hamid has expanded his clientele by offering cutting edge technology, investing in computerized equipment and a $200,000 spray booth that can accommodate 12 cars at a time. Walk into the cavernous garage and you see hundreds of tires piled high on the ceiling, and mechanics tending to cars. Param Pal, the man from the other Punjab, is busy at work here, checking the underbelly of a red sedan hoisted high on a hydraulic lift. He is striking looking, a tall, strapping bearded Jat who could well be in a Bollywood movie! How did he land up in America? He liked New York and stayed. Gradually he got his own garage, which was doing well. One day the auto lift collapsed while he was under it, and he landed up in hospital for a year. He had to give up the garage and joined the Punjab Auto Shop as their chief mechanic. “Hum Khush hai idhar” (I am happy here.) He likes his job fine, is married and home is right there in Astoria for him. Does he not miss his homeland of Punjab?